An kalikopan han batobarani amo an palibot han batubarani nga nagpapakita hin magnetic force. Furlani, Edward P. (2001). Permanent Magnet and Electromechanical Devices: Materials, Analysis and Applications. Academic Press Series in Electromagnetism. ISBN 0-12-269951-3. OCLC 162129430. Griffiths, David J. (1999). Introduction to Electrodynamics (3rd ed.). Prentice Hall. p. 438. ISBN 0-13-805326-X. OCLC 40251748. Kraftmakher, Yaakov (2001). "Two experiments with rotating magnetic field". Eur. J. Phys. 22 (5): 477–482. Bibcode:2001EJPh...22..477K. doi:10.1088/0143-0807/22/5/302. Melle, Sonia; Rubio, Miguel A.; Fuller, Gerald G. (2000). "Structure and dynamics of magnetorheological fluids in rotating magnetic fields". Phys. Rev. E 61 (4): 4111–4117. Bibcode:2000PhRvE..61.4111M. doi:10.1103/PhysRevE.61.4111. Rao, Nannapaneni N. (1994). Elements of engineering electromagnetics (4th ed.). Prentice Hall. ISBN 0-13-948746-8. OCLC 221993786. Mielnik, Bogdan; FernáNdez c., David J. Fernández C. (1989). "An electron trapped in a rotating magnetic field". Journal of Mathematical Physics 30 (2): 537–549. Bibcode:1989JMP....30..537M. doi:10.1063/1.528419. Thalmann, Julia K. (2010). Evolution of Coronal Magnetic Fields. uni-edition. ISBN 978-3-942171-41-0. Whittaker, E. T. (1951). A History of the Theories of Aether and Electricity. Dover Publications. p. 34. 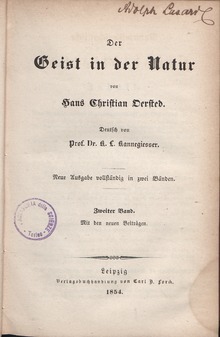 ISBN 0-486-26126-3. http://www.archive.org/details/historyoftheorie00whitrich. Oppelt, Arnulf (2 November 2006). "magnetic field strength". Ginkuhà 4 June 2007. "magnetic field strength converter". Ginkuhà 4 June 2007. "Induction Motor – Rotating Fields". "Magnetic Fields" Arc & Mitre Magnetic Field Diagrams. Magnet Expert Ltd.
Ini nga pakli kataposan nga ginliwat dida han 00:40, 11 Mayo 2015.